The Department of Medicine has oversight of three required clerkships in the undergraduate medical education program: the internal medicine clerkship, the ambulatory internal medicine clerkship (a component of the IM clerkship), and the geriatric medicine clerkship. 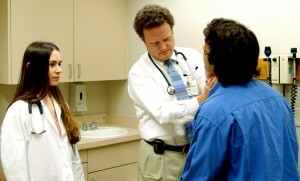 Internal Medicine clerkship director Brian Wispelwey, MD, with medical student and patient. The Internal Medicine clerkship, led by Department of Medicine Associate Vice Chair for Education Brian Wispelwey, MD, and taught and administered by DOM faculty and staff, is undertaken by medical students in their third year of training. It provides students with a basic fund of knowledge about common clinical problems encountered in the practice of internal medicine, in both inpatient and outpatient settings. Students also gain experience with the practice of evidence-based medicine and the coordination of ancillary allied health services, such as physical therapy and occupational therapy. 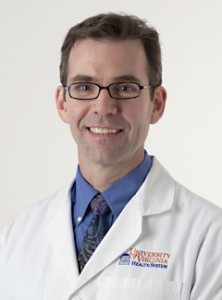 The Ambulatory Internal Medicine (AIM) portion of the Internal Medicine clerkship is under the direction of Division of General Medicine faculty member Evan Heald, MD. AIM covers common conditions, tests and professional issues encountered in the outpatient clinical setting. 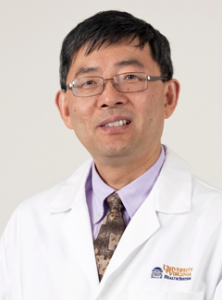 The Geriatric Medicine Clerkship, led by Huai Cheng, MD, is organized and taught by the Geriatric Medicine section of the Division of General, Geriatric, Palliative & Hospital Medicine in the Department of Medicine. This required two-week clerkship, taken during the fourth year of medical school, involves students in the daily care of older patients who have a wide variety of acute and chronic illnesses and abnormal physical findings. Each student is paired with a physician mentor for clinical teaching and ongoing feedback, and is responsible for his or her own panel of patients at a skilled nursing facility.